Cathy wants a rich and successful life, and fast. She visits a medium who tells her she will meet a man who will inherit a lot of money, and die in a violent way soon after. When she meets grossly overweight Charlie who informs her of his rich relatives, she promptly marries him. As it turns out, the medium is always right. Cathy Marno: Al, look at this guy who just walked in. Jesus, is he huge! Cathy Marno: Which guy? How can you miss him? He's so big he probably has his own ZIP code. Al: Oh, you mean the full-sized guy? Not your type, huh? Cathy Marno: I don't even think he's my species! In 1950, the secretary Cathy (Demi Moore) is a gold digger that wants to marry a wealthy man. When the visits the clairvoyant Madame Vorma (Natalia Nogulich), she predicts that Cathy will be fired from her job and find a new job on the same day. Things happen exactly as foretold by Vorma and Cathy visits her again. Now the medium tells that she will marry a man that will inherit a fortune and die in a violent way immediately after. When Cathy meets the repulsive overweight Charlie Marno (Jeffrey Tambor), she learns that he has a wealthy uncle. Cathy gets married to him and soon she finds that the prediction of Madame Vorma was correctcorrect, but not the way she thought. 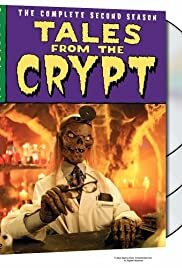 "Dead Right" is one of my favorite "Tales from the Crypt", with black humor to the best. Cathy is the beauty but also a heartless woman and Charlie is the beast and also a loser. His makeup is impressive and the guy looks like a monster. Madame Vorma is a cynical medium and the result is a funny episode. My vote is eight.